The documentary was produced and edited by Katayoun Dowlatshahi, Lead Artist for Northwich, as part of the COLLECT: Memorial Capture Project, set up to document and collect memories associated with the Memorial Hall in Northwich prior to its demolition in 2013. It is the first of several regeneration initiatives in Northwich. Four archived films were found in the North West Film Archive and their re-emergence now resonates with the regeneration of Northwich town centre as three of the four films echo a similar theme of regeneration; they date from 1938. The narrative was researched and narrated by Brett Langston, Research Consultant at Cheshire Archives and Local Studies Section of the Record Office in Chester. The duration of the film is one hour. Copyright of archive footage is with North West Film Archive, Vicky Eachus and Sir John Deane's College. This documentary was a joint production commissioned by Lead Artist for Northwich Katayoun Dowlatshahi on behalf of Cheshire West and Chester Council and filmed by Mid Cheshire College Students. The film was produced as part of COLLECT: Memorial Capture Project, to document the Memorial Hall in Northwich and associated memories prior to its demolition in 2013. British Pathe also have a film of the 1946 Northwich Floods. Click here to watch an excerpt of the film. Facebook Group for Northwich: Past and Present Then and Now here. 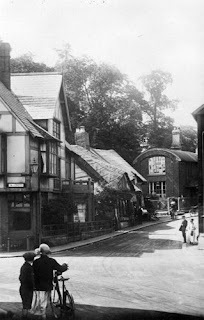 Facebook Group for Northwich: Past and Present here. Facebook Group for Mid Cheshire Through Time here. Daniel Clark's Northwich History here and here. Brunner Mond History twitter here. Cheshire Tithe Map Website here. shot by SJD Students in 1966 here. The Park won the Royal Television Society Award for North West undergraduate drama in 2007. Based on the Marbury Lady/White Lady ghost myth and filmed at Marbury Country Park, Northwich, Cheshire. The Park is a ghost film made by Nick Gillespie in 2006 which stars Phoebe Jones and Lauren Pressdee. In early 1962 radio personality Franklin Engelmann visits Northwich, Cheshire for the BBC Light Programme series 'Down Your Way' and interviews ex double bass (tuba) player and junk shop owner Joseph Allman. Video by Northwich Punk Band The Red Neck Zombies, filmed around Northwich (2010).